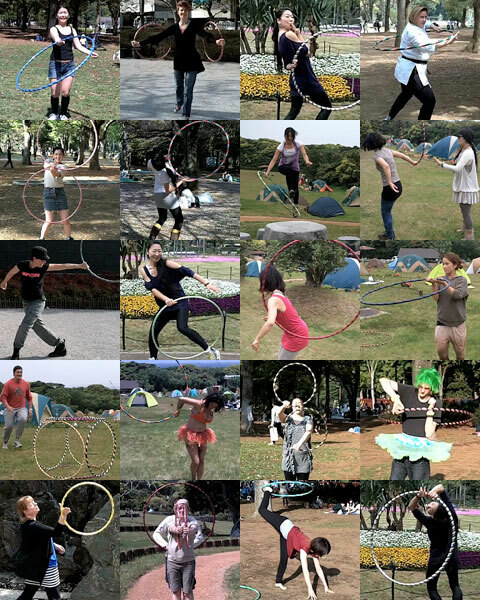 The hooping community in Tokyo and throughout Japan is pretty incredible. Since the Tohoku quake and tsunami struck, many of our active, lively and lovely hoopers have been helping the disaster victims in many ways. Sareh volunteered for a week of clearing muck in Ishinomaki and plans to return for more. She organised a flea market, too. Roon Roon has been performing in the shelters. Ayumi collected donations for the Red Cross in her classes. Deanne sold all her extra hoops and donated the proceeds. Heather gathered items for a local aid initiative. Soness made a call for a private shelter run by her Japanese family. Some hoopers are too humble to talk about what they are doing and I know there has been move volunteerism. Countless others have donated money to charities and NGOs. And now we launch a new fundraiser as a community – the Japan Tricks Showcase – as an outreach to hoopers around the world. Over the last month, I’ve been running around filming my favorite hooping friends doing new and original moves. From early April until the end of Guru-guru Camp, I collected 20 moves from 19 clever and wonderful hoopers then edited them together into a 13 minute long video. It’s sort of a tutorial with each move shown in real time and in slow motion. Each move is also a individual tutorial. There are tricks for beginners and by beginners, complex combos for performance, some moves that are elegant and some that are funny. They are all free to watch. We truly hope that you will donate to one of the charities we support. They are all described on the project page with links to their websites and donation pages. I’ve been in touch with the leaders of each of them and they are grateful for our support. Whether you offer one dollar or a hundred, whatever you can afford will help to ease the trouble in northern Japan. Please open your heart, open your wallet and give generously.